A very average Bond film, there are a couple of things that work here, but mostly this one is a dud. This is the Bond movie that tries to do way too much, and as a result, loses both our focus and interest. Now there’s plenty that works about this film, including two diamond smuggling villains who murder people and then look the other way, with nobody ever discovering who did it. But then there’s also a villain Blofeld (the most famous Bond villain in the series,) and already there, you have too much. Either there is a clear connection between these villains (which would have been cool,) or else what we are really looking at is the makings of two different movies, all thrown together into one jumbled mess. That’s what this one feels like. There are definitely some redeeming factors, including a great pre-title opening sequence and a pretty cool scene where Bond takes on two acrobatic girls named Bambi and Thumper, but for the most part, this film is overly complicated and all over the place. 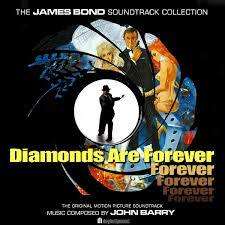 Diamonds Are Forever is one of the later Sean Connery, James Bond movies. It is also one of the more forgettable, of his turns, as the iconic hero. Connery made four Bond movies in the sixties, and then this one in the early seventies. Still, a decade later, he returned one more time for Never Say Never Again. Both that movie, as well as Diamonds, was not as good as the original four. Connery’s first four bond films are all classics. 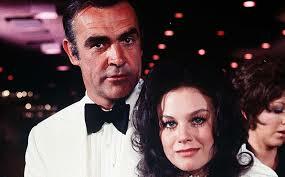 Dr. No, Thunderball, Goldfinger (his best,) and finally From Russia With Love. Those four are all very well-known and considered the original batch. Diamonds Are Forever doesn’t quite make the cut. The movie has a number of scenes that excel and bring it up to a level that could easily compete with the earlier Connery films. But then, there are plenty of dull moments and ridiculous ideas to swallow up whatever qualities of this movie were actually working. The storyline gets so misguided that it ends up clouding everything else, including the action. As a result, some of the action doesn’t work, simply because the scenes are thrown rushed, awkwardly thrown together, and barely explained. Stunts are only as good as the level of which the audience cares and is invested in the characters. Diamonds are Forever opens with a character being asked where Blofeld is. We don’t see the man who’s doing the asking, but can tell from the voice that it’s Connery. When no answer is given, we see Bond’s fist fly onto the screen and hit this man. Then we cut to another scene where something very similar happens. It all moves fast, giving us the idea that Bond is out to get information and in a big hurry. When he asks the question to a woman, who is hanging out in her bedroom in a bra, we see Bond walk onto the screen for the first time. She tries to seduce him, and Bond responds by snapping off her bra and wrapping it around her throat. This all leads to Bond getting enough information to locate Blofelds secret lab. Now, Blofeld is the iconic villain who always sits behind a screen stroking a white cat. He has been played by a number of actors over the years, usually in silhouette, hidden behind a shade. In this movie, we get to see his face. In fact, the storyline has some fun with that idea, starting with the first time Bond finds him. Blofeld is making other versions of himself, getting his bodyguards to get plastic surgery so that their faces all look like his. When Bond enters the surgery room, he finds a sort of mud bath with a man inside. The man raises a gun out of the bath, and Bond ducks the shot. He presses a button to dump more mud on the man (which comes out thick, like cement,) and kills him. Then another Blofeld approaches (possibly the real one, with all of the explaining he does.) Bond sends him flying into another mud bath (this one boiling and bubbling up like lava,) and then walks away. Cue the music and opening credits sequence. Many opening Bond scenes don’t lead into the plot of the rest of the movie, and are simply there for an exciting introduction. The one featured here is longer than usual, and so it’s a good thing that this introduction, pre-credits sequence actually does lead us toward what is to come, with Blofeld and the clone-like face changing. The real story, however, begins after the title sequence, with some montages and information about why the British MI6 (the team Bond works for,) is interested in diamonds. They have knowledge that diamonds are being smuggled out of the mines of South Africa, and brought to dentists. The mine workers smuggle the diamonds inside of their mouths. The dentists then remove the diamonds and pay off the mine workers. Then the dentists sell the diamonds to the dealers. We watch an example of all of this happening. A dentist walks away from his office with a brief case full of diamonds. He goes to meet a helicopter of buyers, but is intercepted and murdered by two gentlemen in the desert, before he does. These guys get the diamonds and now deal with the helicopter, when it arrives, themselves. Instead of giving the pilot the diamonds, they give him a case with a bomb inside. This leads to the helicopter blowing up. Bond, meanwhile, is sent to Amsterdam to meet a woman named Tiffany Case, who knows these two men and is involved with the transfer of their diamonds. She is also tracking Bond, starting with making a copy of his fingerprints. Bond fights off a man in his hotel elevator, named Peter Franks, and then assumes this man’s identity. Bond pretends that he is Franks, and that he has just killed a man known as James Bond. From here, the movie starts to slow down quite a bit. It gets confusing at times (the part where Bond either is, or is not, in a coffin as it heads into a fire,) and just plain boring at others. At one point Bond makes a deal, only he isn’t given real money and so he doesn’t give them the real diamonds in return. What a waste of time. There are lots of scenes and characters, like this, that don’t amount to very much. Another scene has armed men come visit him in his hotel room, throw a girl into a pool, and then leave. Two more people are murdered. An older woman in Amsterdam, and then a stand-up comic, named Shady, in Vegas. Maybe it’s supposed to be exciting, but it’s not. Instead, it feels like a jumbled up list of events, with not enough connective tissue. It takes a while for any meaning to come from all of this. A connection finally comes in a backyard pool scene, with a drowned woman who the killers thought was Tiffany Case. Bond explains to Case all of the different people who have been killed for these diamonds, from the dentist in Africa to the old woman in Amsterdam, to Shady, to the woman at the bottom of the pool. Just when it seems like the plot is being cleared up and things might finally get interesting again, the movie loses its way once more. We suddenly get three chases in a row, with each one of them being more ridiculous and dopey than the last. There’s a car chase in the dessert, a moon-rover car chase in a lab, and finally a car chase in a Vegas parking lot. None of these action scenes is vey good. Maybe this was cool for its time (a car driving on its side two wheels, for example,) but compared to movies of today, this is just plain silly. At this point, in the second half, some moments do work, but most of them don’t. There’s a very cool fight between Bond and two girls named Bambi and Thumper, who do flips, cartwheels and hanging kicks all over an overlook apartment building. If only more of the movie had been like this. Unfortunately, at this point, it’s too little too late. That’s really the problem with this movie. For every good scene, there are about three lousy ones. The ending, involving switching tapes, is something we’ve seen a thousand times before. Instead of giving us one car chase that actually works, this movie gives us three in a row that don’t. I like the storyline about the two diamond dealing killers, but then there are a whole bunch of lousy stories to go with it. There’s the story of Blofeld, the story of the satellite made of diamonds, and the story of Tiffany Case. Maybe it’s that this movie is too overloaded, because there’s a whole lot in here that just doesn’t work.